For a medium defined by limitations, I’m always surprised by the flexibility of pixel art. As a nature lover, I’ve been pleasantly surprised by how well pixels handle landscape art. In my beginner days, I thought the hard edges and overall blockiness was a poor fit for natural subjects. However, with practice I discovered the abstraction of low resolution lends an expressionist quality well suited for landscape art. What was once thought as a limitation becomes an advantage, and so goes the story of pixel art. For me, the heart of a landscape is what’s written in the sky, and clouds are the language of this beautiful poetry. While clouds offer a good opportunity to play with creative forms, it’s important to become familiar with the scientific classification of cloud shapes and the circumstances behind them. But I’m not here to give a science lesson. Depending on geography we all have an intimacy with certain skies and more or less know how clouds work. I’m a big fan of fair weather days full of lots of puffy cumulus clouds. 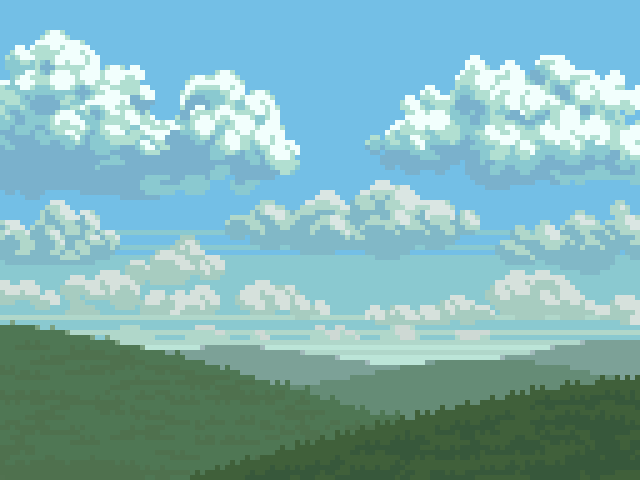 This is just one style of cloud, but this basic technique can be used to make all kinds of clouds. Try various shapes and light conditions. One of the most effective ways to capture depth in a landscape is atmospheric perspective, or also called aerial perspective. Atmospheric perspective is the effect the atmosphere has on the appearance of objects depending on viewing distance. The further the object, the more it takes on the color of atmospheric haze. In a day time setting, close objects are more saturated with clear contrast between light and shadow, while far objects become less saturated and contain less colors. The vertical position of an object on the canvas also informs the depth. The closer an object is to the vertical position of the horizon, the more distant it appears. Lighting totally changes the mood of a scene. Bright blue skies gives both an energetic and relaxing feeling. The warm hues of dawn create a contemplative mood, while a fiery sunset can speak of romance. Let’s get creative and explore the expressive qualities of the sky. Nothing inspires quite like a real nature experience. Wherever you live, I hope you can easily access clean nature. I recommend you explore your local surroundings, take photographs, and study the landscape. I love going on long country drives and exploring every interesting nook I can find. While I don’t often follow one particular image, my collection of photographs, and visual memory of my experiences, help guide my vision. When your art expresses something from your true surroundings the heart can be felt. Was this article helpful? If you find value in my content please consider becoming a Patreon member. Among many other rewards, Pixel Insider members get extra resources to compliment my tutorials. But most importantly, you allow me to continue making new content. This month I’m sharing Prairie Churches asset pack, which includes 9 top-down church sprites from my pixelminis series. Each made at 64x64px, these detailed structures can be put to good use in your pixel art studies or game dev projects. If you're not ready to commit to the subscription model of Patreon, make a one-time donation and receive exclusive art and resources. Fan support is necessary to keep producing content. Thank you!